NVIDIA has quietly updated its product pages to include the first graphics card from the GeForce 300-series line. Don't get too excited, though, as the first 300-series product is a low-end solution that's currently available to OEMs only. Dubbed the GeForce 310, the card isn't based on the upcoming Fermi architecture and is instead a basic GT200-series card with a GPU clocked at 589MHz and 16 stream processors clocked at 1,402MHz. Look familiar? It should do, as it's little more than a rebranded GeForce 210. As far as we can tell, there's no physical change, despite the massive jump in model number. 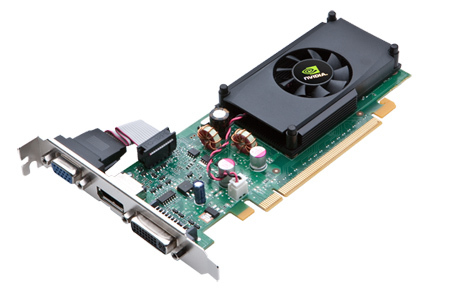 Seems as though NVIDIA might be padding out the low-end GeForce 300-series range with rebranded 200-series cards. Meanwhile, the company's first DirectX 11 cards, based on the all-new Fermi architecture and expected to fill the mid-range and high-end segments, are rumoured to have been delayed until the first quarter of fiscal 2011. You really would have thought they would've learned from the last renaming furore that this sort of consumer misleading practice is not welcome and damages their reputation further. with minor changes, but still.